The U.S. military is turning to a well-known weapon of Native Americans to help with the fight in Iraq and Afghanistan – the Tomahawk. A Tomahawk is a type of ax that has been used as both a weapon and a tool by Native Americans for hundreds of years. The word "Tomahawk" is translated from a word by the Virginia Algonquin natives called "Powhatan." Native Americans have traditionally regarded Tomahawks as a general purpose tool. However, they have also used the ax device in battle – either during hand-to-hand combat or as a throwing weapon. Tomahawks were originally made with stone ax-shaped heads. These later changed to iron and brass heads. European settlers to North America quickly adopted the Tomahawk as a tool and weapon as well, and the instruments became popular trading items between natives and settlers in the 17th and 18th centuries. Today, Tomahawk throwing is a popular event at American historical re-enactments and is also a category in competitive knife throwing. Special handmade Tomahawk’s are still made by master craftsmen throughout the U.S. and Native American bands. Now, the U.S. military is adopting the Tomahawk for use in hot spots such as Iraq and Afghanistan. The U.S. Army Stryker Brigade is employing Tomahawks in Afghanistan, and the device is used by several American reconnaissance platoons in Iraq. A Tomahawk is also included in each Stryker vehicle as part of a "tool kit." A Stryker is a 4 x 4armored fighting vehicle. 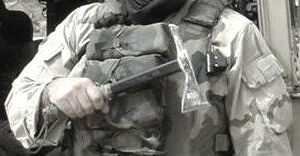 Soldiers are using Tomahawks for hand-to-hand combat and for taking down doors and entering buildings. The Tomahawk is proving to be a diverse instrument with multiple applications with the U.S. military. In addition to its use in combat, soldiers are also using Tomahawks to open crates, dig trenches, remove road obstacles and knock out improvised explosive devices and detonate landmines. The Tomahawk’s used by the U.S. military are manufactured by the American Tomahawk Company based in Byesville, Ohio.